Considering the fact that only three Mets have worn the number 14, I thought it might be hard to keep up my Magic Number series. First and foremost, including Gil Hodges was a non-starter. Sure, he was an original Met. That meant he played on the worst team in MLB history. He also turned the franchise around as a manager and was in the dugout when the Miracle Mets won the 1969 World Series. He also died too young. Lastly, the number 14 was retired in his honor. Now, Boyer is a borderline Hall of Famer. However, in the great tradition of Mets acquisitions, he was better elsewhere, much better. Boyer might have been a five time Gd Gliver, an MVP, and seven time All Star, but he was an also-ran with the Mets. A career .287/.349/.462 hitter would hit .266/.304/.415 in 1966 and .235/.335/.355 in 1967 before he was traded to the White Sox. He was not Ken Boyer in Flushing. In 1966, the Mets finished in ninth place (the penultimate place) with a 66-95 record. In 1967, the Mets finished in last place with a 61-101 record. Boyer was a sign of the rough times. assured, he could be in the Hall, but certainly not fur his play with the Mets. 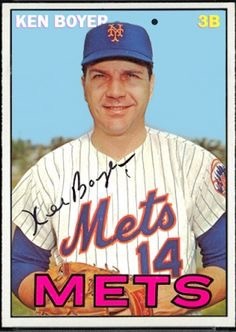 So without further ado, let’s all offer a hat tip to Magic Number 14, Ken Boyer.